D.J. McHale and Patrick Carman are two of the six authors writing a new series for kids. 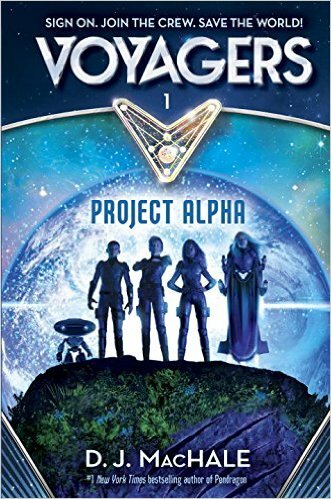 Voyagers is an interactive series involving books as well as online games and puzzles. The other authors are Robin Wasserman, Kekla Magoon, Jeanne DuPrau, and Wendy Mass. You can read more about the Voyager project at voyagershq.com. D.J. McHale, author of Book #1: Project Alpha, is better known as the author of the bestselling Pendragon series and TV shows including Are You Afraid of the Dark. Patrick Carman is the author of Book #3: Omega Rising. He is the author of several books for grade and middle-schoolers, including The 39 Clues. In this interview, they talk about working on the series, its connection to their other projects, and how to encourage reluctant readers. What drew each of you to this project? D.J. : The last space travel story I wrote was when I was nine years old. So I figured I was due. Pat: I was a Star Wars nut growing up. Those first three movies came out when I was 11, 13, and 15 – a very impressionable time for every kid in my seventies neighborhood. There was never anything that captured our imaginations like Star Wars did. We geeked out over every creature, sub-plot, villain, hero – and then, sadly, it was over. And so was my childhood! I’ve been trying to build a world like that ever since. A place the 12-year-old Patrick would go to escape whatever troubles were happening in the real world. A place I could return to, again and again, and just feel like a kid on an adventure, beating impossible odds and saving the day. It took several years to figure it all out, but Voyagers fills that void for me. I’m a kid again! How much of this project was a collaboration between all the authors? Did you have input on the digital aspects? Did you have input on each other’s stories? Did you have to try to match each others’ writing styles, or do they all have a unique voice? D.J. : Being the first author up, I had the freedom to write my story the way I write all of my other stories without having to worry about what came before. However, as I was writing away, the entire Voyagers team was still tweaking and hatching new ideas. So I would often get notes saying: “This has changed now” or “We need you to add this”. One example of that came with the addition of the Zrks…the small flying robots that maintain the space ship. I had no Zrks in my original draft so I had to go back and figure out a way to incorporate them into the story. Working in the other direction, it’s been fun to see how some of the bits I created have found their way into the digital material, like the rock-moss-creature and the ankle-biting varmints on J-16. Pat created an amazing universe and it was fun to help expand it even further. Then again, I felt the stress of some of the other authors who were waiting patiently to see what I had done before starting on their own stories. I don’t like to send out anything I’ve written while it’s still a work in progress, but I understood the time pressure. They had to get writing! So I reluctantly sent out a couple of early, rough chapters. That was nerve-wracking. Pat: Working on 39 Clues gave me some good experience that really helped with Voyagers. I was able to take the parts about writing 39 Clues that I loved and apply them to the work the team did on Voyagers. First and foremost, you need seasoned, excellent writing talent to make something like this work. And we have that covered with the Voyagers writing team – they brought their A game across the board! I provided a world bible for the series, along with an outline for each of the six books. But it was very clear from the get go that each writer should make their own choices about the book they were writing. For each writer, the outline was a line down the middle of a page, like a magnet pulling the plot in the right direction. But each author was encouraged to swing outside the line with whatever felt right to them. The digital experience – both the interactive website and the game for phones and tablets – was handled by a completely different team. We partnered with 42 Entertainment and Liv Games, two best in class digital companies, and I think we’ve created a digital world that rivals anything we’ve seen in publishing so far. There’s so much for kids to plug into! The Voyagers world is big enough to hold any kid’s imagination. 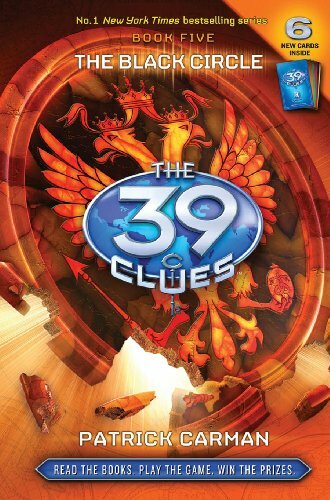 Patrick, you wrote for the series The 39 Clues, which is about solving mysteries in a way that involves the reader interactively. In what ways is this approach similar to that of the Voyager series? Why is it important to make the reader a participant in the story? I spend a lot of time at schools. 1400 of them and counting. So I get to interact with young readers across the country. I can sit down with them in a school library and ask them straight up: what’s it going to take to get you to turn more pages? More often than not the answer I get has to do with making books more interactive and bridging the gap between the printed page and the digital world they all live in. Voyagers answers that question with a resounding YES WE CAN! The big digital idea here is to allow young readers to join the crew of the Cloud Leopard, the ship that takes our characters out into space. They complete recon missions, collect dozens of robots, and fix the ship when it has problems. They also learn a lot about science, technology, engineering, and math. So the digital part of the Voyagers world extends the reading in a way that makes the whole experience richer and broader. Readers really feel like a part of the story. 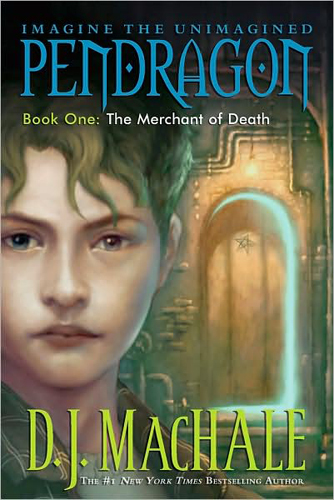 D.J., Your Pendragon series combines fantasy, science fiction, and interstellar travel. How was working on this series similar or different? D.J. : All good stories have the same things in common. They’re about interesting characters dealing with compelling conflict. That applies whether you’re writing a romance, a comedy or a sci-fi space adventure. I like to write stories about real and relatable characters who find themselves in a bigger than life adventure. I don’t like to write about characters with super powers or incredible abilities. That can be fun, but I want readers to relate to the characters and to imagine themselves in their shoes. That’s very much what Pendragon is like, and so is Voyagers. The fun part comes once you’ve done a good job creating those characters. Then you can let your imagination run wild in creating the various dangers they face. One thing that was very much the same for me in writing these two different stories is that I like to put my characters into dangerous situations where I’m not really sure how they’re going to save themselves. It’s like living the adventure along with your characters as you put yourself into the situation and try to find your way out of it. With Pendragon I created those situations myself. With Voyagers, I was given some very big challenges that the characters would face. It was almost as if I was thrust into the situation myself and had a blast trying to figure a way out. What advice would you give parents whose kids say that they just aren’t into reading? how has a love of reading enriched your lives, and what sparked it? D.J. : I have been a reader and a writer since I was very little. I don’t know what else I would do if I couldn’t write. Reading helps me to constantly learn new things about the world while challenging my brain to stretch and think in different ways. The best advice I can give to a parent who has a reluctant reader, is to help them find the right books. That isn’t always easy, but even the most reluctant reader will sit down and stick with a book if it sparks their imagination. Here’s a suggestion. Rather than handing your child a book and saying: “Read this!”, ask them to read their age. If they’re 9, ask them to read 9 pages. If they’re 15, get them to read 15. It’s much less daunting than staring at a thick book, thinking they’ll never get through it. After reading their age they’ll have a pretty good idea if the book is right for them or not. If it isn’t, just as well. Move on. But if it is, those few pages will grab their attention and hold on tight until the final page is turned. Pat: It took me awhile to get into books as a kid. I was fine with comic books, but a book with no pictures? That took some real work. I would have died for something like Voyagers when I was 10 or 11! Because like a lot of kids that age, I was into finding adventure in the neighborhood, playing video games, and building forts. 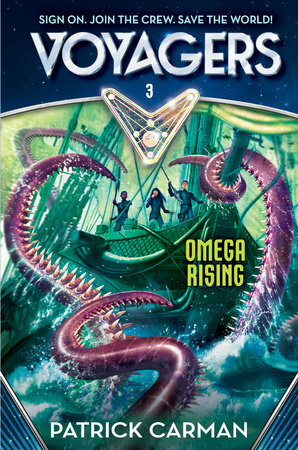 So I think if you’re a parent with a kid who is easily distracted by all the fun of just being a 10-year-old, then plugging them into something like Voyagers is going to get them reading. Start by showing them www.voyagershq.com, then download the game app, then hand them the first book. They will be all in! One other note – what did finally get me into reading were very descriptive, adventurous books. The Chronicles of Narnia, stuff by Roald Dahl, The Rats of Nimh – those kinds of books did it for me. And the Voyagers writing team delivers that kind of thrilling, page turning action. This entry was posted in Interviews and Special Guests and tagged D.J. McHale, getting kids to read, interactive reading, Patrick Carman, Voyagers.